Traditional high gloss mirror finish plate. Available in range of thicknesses and with matt borders. 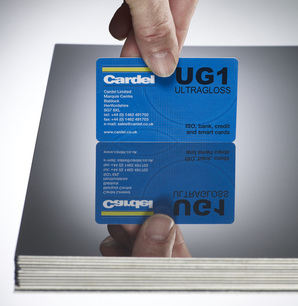 Medium gloss mirror finish plate. Improved lifecycle of plates – slightly less sensitive to light scratches on the surface. Precision finish light matt / satin plate. Suitable for magnetic stripe cards and all range of printed surfaces. Widely used in bank card production. Medium matt and high matt lamination plates – range of finishes available. Widely used for production of prelaminated inlays. Cardel offers etched and engraved lamination plates with a range of security features, including microtext, braille / guilloche, and logos. Registration pins, positioning holes and cassette systems are available on request. (>400 HV on surface of plates).